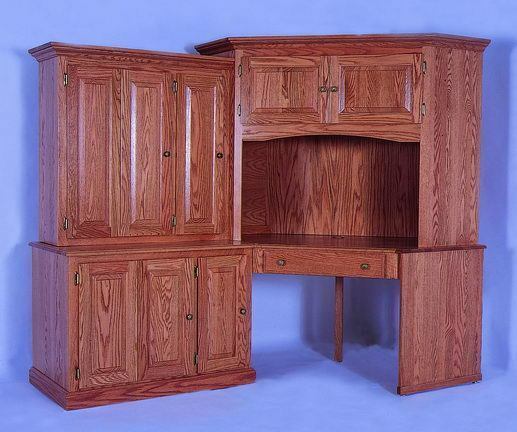 This stunning Amish handcrafted Corner Computer Desk will look great in any home office or business setting. If you need additional storage space, then this desk is perfect for your office & storage needs. It also provides a productive work space where you can set up a laptop or desktop computer. Check out the CPU cabinet that can be used for your computer tower or for extra storage space if using a laptop and not a CPU tower. A small printer or a small fax machine can also be placed on one of the two pull out shelves for easy access. This solid wood corner computer desk is an heirloom piece that will be enjoyed for generations. Contact one of our knowledgeable furniture specialists today for custom ordering assistance or with questions on a matching file cabinet, credenza or desk chair to complete the look of your new office. Right Wall Space: 85 ¾"